On Thursday, April 4th, MTA and New York NCSY partnered to present a Pre-Pesach Mishmar Madness program for MTA talmidim. MTA hosts Mishmar Madness – a post-Mishmar program that includes additional learning opportunities accompanied by dinner and activities – 5 times per year to enhance Torah learning for its talmidim. 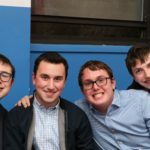 This event was presented in partnership with New York NCSY and featured chaburahs with MTA alumni and NCSY advisors, shiurim with MTA rebbeim, interactive discussions with NCSY staff, exciting panoply games, and a lively fabregen with world-renowned educator and NCSY Mashpiah Rav Judah Mischel.